Can Wentz and Stump talk the talk? Bassist Pete Wentz's well-known skills as a motormouth will come in handy as he and Fall Out Boy frontman Patrick Stump attempt to break a Guinness World Record of most radio interviews by a pair completed in 24 hours. The two band members will attempt to hit as many radio stations as possible across America on 31 October (which just so happens to be Halloween) Oct. 31 beginning at 3 pm PST at Premiere Studios in Los Angeles. For those keeping track of such things, the current record for radio interviews completed by two people in 24 hours is 57. 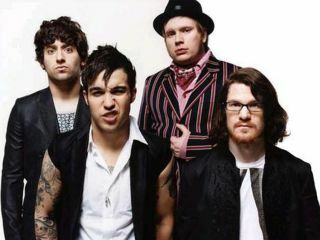 Fall Out Boy attempted to break another world record by playing a show at a scientific colony in Antarctica earlier this year, but their efforts were thwarted by bad weather. Should Wentz and Stump break the interview record - and meteorological conditions shouldn't be an issue in this case - it'll be great promotion for the launch of Fall Out Boy's new album, Folie A Deux, coming 15 and 16 December.